“A meme is any learned feeling, thought or behavior. Examples include thoughts, ideas, theories, practices, habits, songs, dances and moods. Memes propagate themselves and can move through a sociological “culture” in a manner similar to the behavior of a virus. As a unit of cultural evolution, a meme in some ways resembles a biological gene. 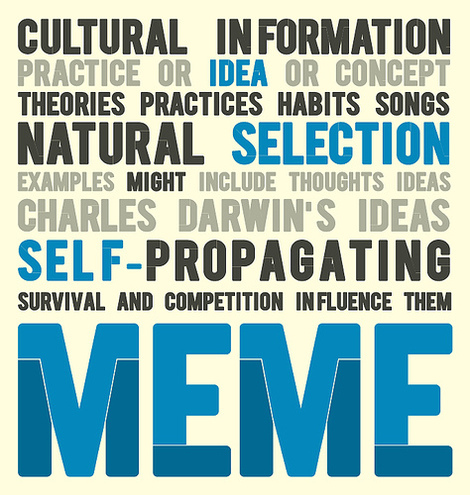 The word “meme” is a neologism coined in 1976 by Richard Dawkins to describe how one might extend Darwinian principles to explain the spread of ideas and cultural phenomena. He gave as examples tunes, catch-phrases, beliefs, clothing-fashions, and the technology of building arches. This talk of ‘temes’ sounds quite similar to what Kevin Kelly has described as the Technium. I’ve mentioned this in a previous post. You should definitely check it out.